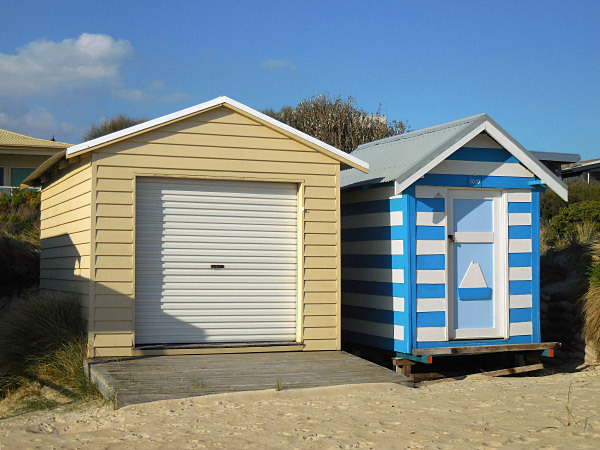 ‘Boatsheds’ and ‘Bathing boxes’ are an iconic feature of various beaches all around Port Phillip in Victoria, Australia. These colourful wooden buildings – typically built in groups just above the high-water mark – are designed to securely house belongings directly on beaches. Boatsheds are generally larger and are intended mainly to store a boat, hence they often have an integrated ramp and winch (see photo). Bathing boxes are smaller and are intended mainly to provide a private space for changing into and out of bathing gear. Intended use aside, either structure can be used for either purpose. The only real restriction is that people may not live in them. Besides their visual appeal, boatsheds and bathing boxes have heritage significance, many having been built in the late 1800s and early 1900s. Maintaining the historic character of Victoria's boatsheds is an important part of ownership. The City of Kingston lies on the eastern shores of Port Phillip, some 15km south-east of Melbourne. The City is home to 190 boatsheds and bathing boxes along a 6km stretch of wide, sandy beach between Aspendale in central Kingston and Bonbeach in Kingston's south (see map). Kingston's boatsheds can usually be found within a short walk from the side streets that run between Nepean Highway and the foreshore. See the following PDF file for a full list of all of Kingston's boatshed locations and the nearest streets. The change to suburbia along the ‘Long Beach’ meant people far away from public salt-water baths nearer Melbourne (at the time) made the most of favourable swimming opportunities. The City of Chelsea imposed a residency and/or ratepayer requirement in 1934 for all foreshore licences issued within the City. Boatsheds and bathing boxes continued to be built after WWII until the mid 1960s. An important stakeholder representing nearly all foreshore licence holders is the Kingston Boatshed Association (KBA). The Association was formed to respond to expressed summer grievances culminating in a Kingston City Council (Council) organised meeting on 27-Mar-2002, attended by invited speakers, licence holders and families. The Association incorporated on 24-May-2002 with objectives that include preserving and promoting local heritage and culture, representing members and providing Council’s mandatory boatshed public liability insurance. Council’s Boatshed and Bathing Box Policy – with change iterations and other matters – is jointly reviewed. 1Victorian Parliamentary Papers, (1915), ‘First Progress Report from the Royal Commission on the Housing Conditions of the People in the Metropolis’ in Grant, J. & Serle, G. (1978), The Melbourne Scene 1803-1956, pp. 241-242.